C oral reef ecosystems are biodiversity hotspots estimated to be home to millions of species. Many of these species form mutually beneficial relationships with other organisms, known as symbioses. One of these symbioses is that of the single celled foraminifera (protist) Marginopora vertebralis hosting the dinoflagellate Symbiodinium sp.. While there has been considerable research into the photo-protective capacity of Symbiodinium, little is known about the role of the host in providing photoprotection in symbiotic systems. I n this study we describe a new mechanism for photoprotection that is mediated by the host organism, where that the intracellular movement of symbionts within Marginorpora vertebralis is driven by the host. Under high and potentially damaging irradiances the host actively relocates its symbionts deeper into its calcium carbonate skeleton, thus providing photoprotection. By using photosynthetic inhibitors we identified that the info-chemical signalling for host regulation was photosynthetically derived, highlighting the presence of an intimate communication between the symbiont and the host. 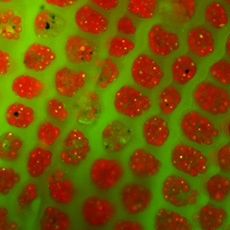 Microscopy flourescence image of symbionts within the carbonate test of the foraminifera Marginopora vertebralis.